Triple Layers of Turquoise, Chocolate Brown, and Fleur De Leis! This is 92" of ribbon rolled into one awesome bow. The bottom layer is a 2.25" Turquoise grosgrain ribbon, then a 1.5" chocolate brown grosgrain ribbon, topped off with a 7/8" turquoise Fleur De Leis Satin ribbon. The Fleur De Leis also has a glittering gold to make them shine. All wrapped together with a chocolate brown ribbon and attached to a French clip. 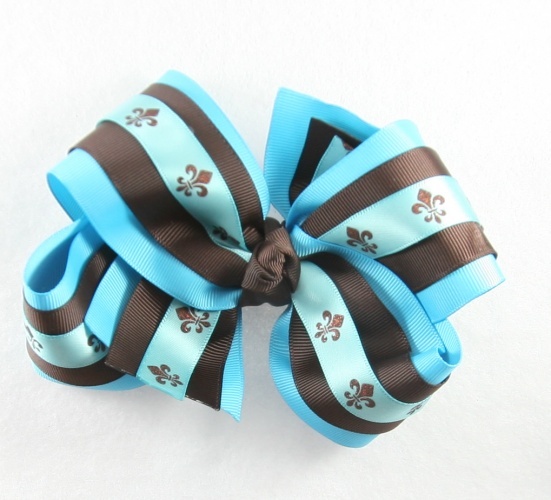 This is the perfect combination of blue, brown and Fleur De Leis that everyone is looking for.